OMAHA, Neb. – February 8, 2018 – Westar Foods, Inc. is proud to donate $8,000 to Nebraska Children’s Home Society (NCHS). 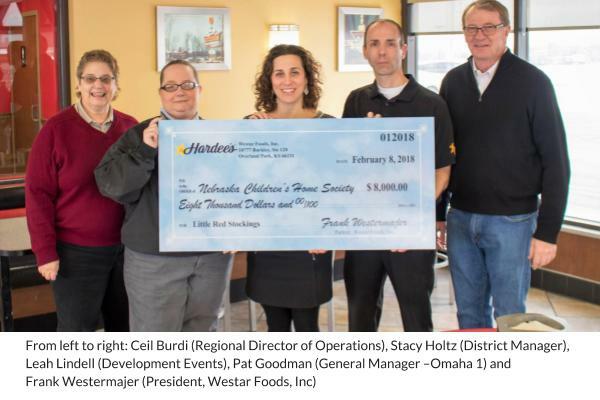 The check presentation will be made at Westar’s Omaha Hardee’s location on 145th Street at 10:00 a.m. on Thursday, February 8th, 2018. The donation is funded with 100% of the proceeds of the sale from Little Red Paper Stockings sold Thanksgiving through Christmas Day at all of the Westar Hardee’s Nebraska locations. Stores sold the $1 stockings in the seven stores. Customers purchasing a stocking received a coupon for a free drink. With this latest donation, the franchise will have donated nearly $52,000 since the Fall of 2012 to NCHS. Established in 1893, Nebraska Children’s Home Society’s mission is “to provide safe and loving care to children of all ages.” Through Adoption, Foster Care, Family Support and Early Childhood Education programs, NCHS provides comprehensive child welfare services throughout the state of Nebraska. Last fiscal year, NCHS served more than 9,400 individuals through 10 offices. The organization remains the only adoption agency in the United States to provide cost-free adoptions. Please visit www.nchs.org for more information, or to learn how you can get involved. Westar Foods is honored to be an independent Hardee’s Franchisee for more than 10 years. The standard of excellence, the commitment to provide quality food, and outstanding customer service has propelled the franchise to double its store units since the original 18 stores acquired in 2007. Visit WestarFoods.com to learn more. For more information, or to find a Hardee’s® store near you, visit Hardees.com.